When you’re looking for that special touch to add to the atmosphere for a special occasion, you may not immediately think of the seating as a vehicle for creating memories. The truth is, however, that this can be the perfect way to not only make guests feel comfortable, but to associate a brand to vibrancy, fun and pure bliss. If there’s one thing that companies continually struggle with, it’s how best to allocate resources for branding and getting their name out there and into people’s minds. With all of the wild marketing campaigns out there, sometimes it’s necessary to think outside the box. One great way to set yourself apart and make a big impression on your clients (current and potential), employees, and partners is to provide truly unique event seating with customised Bliss Bean Bags speak with us today to find out more. Whether you’re throwing a company holiday party, or simply gathering for a meeting, imagine the look on your group’s face when they see that they’ll be relaxing on a collection of inviting, comfortable bean bag chairs. When people are relaxed, it puts them at ease, which means everyone will have an even better time at your corporate event. Even better, Bliss Bean Bags can customise your event seating with your company logo, or any other embroidered design of your choosing. Personalising your event bean bags means your name or logo will be front and centre and impossible for your guests to miss. Comfortable, high-quality furniture pieces make an extraordinary addition to your events, and ensure that everyone takes notice of the care you’ve taken in preparing for the occasion. 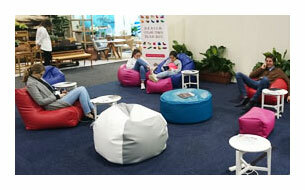 Business gatherings aren’t the only opportunity to utilise the comfort and durability of Bliss Bean Bags. Because we can provide furniture for outdoor use, it’s simple to add some pizzazz to parties like family reunions. Cost prohibitive to provide customised seating for everyone? Give away a bean bag embroidered with the family name as a door prize. The possibilities are endless. When you’re charged with organising an event like a bridal or baby shower, it can be challenging to come up with ideas that will make the day truly special. A personalised bean bag makes an attention-getting seat of honour for the festivities, plus doubles as an unusual, functional, and memorable gift, reminding the guest of honour of her special day for years to come. Finding that stylish yet practical product for your event doesn’t have to be a frustrating experience. Our furniture is crafted to the highest quality standards by our experienced, passionate, and skilled team. Plus, all of our products are made right here in Australia. In fact, we’re so sure you’ll love it that we provide a lifetime warranty, offering you the ultimate peace of mind in your investment. With a multitude of colour options, unparalleled durability and comfort, and the option to customise your bean bags to perfectly highlight any occasion, Bliss can turn your event from ordinary to extraordinary.